[points at self assertively] Me! I brought Bill and Ted and the rest. I’m a hero! 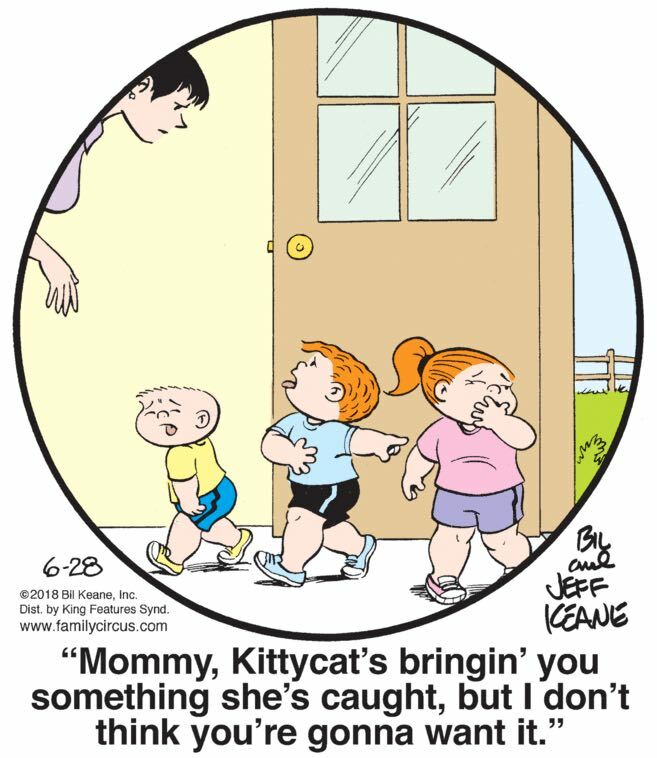 I have to say that I really, unironically enjoy today’s Family Circus, and what sells it for me is the children’s faces of genuine and visceral disgust. Then there’s the fact that cats generally are, over short distances, faster than people, but the Keane Kids still managed to beat Kittycat inside, almost as if she were struggling to drag in something very large, perhaps larger than herself. Is it a human arm? I’m hoping it’s a human arm. The joke here is of course that Darin has offloaded childcare duties on his elderly mother, who already had her hands so full caring for her stroke-striken and paralyzed husband that she had to quit the job she loved, and now she’s just completely exhausted and her grandchild is running around the house largely unsupervised! But I think it’s worth pointing out that, just to add a little color to today’s narrative, Darin and Mopey Pete are slouching across the street in the pouring rain, having neglected to bring protective clothing or umbrellas for whatever reason. Just putting that special Funkyverse twist of abject misery on proceedings!